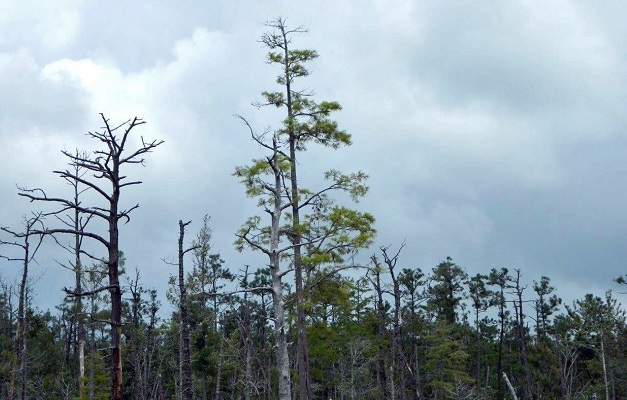 Some forested areas on the North Carolina coast are in decline due to storm surge impacts from Hurricane Irene. Photo by Jamie Dunbar, North Carolina Forest Service. For some residents of the North Carolina coast, the 2014 Independence Day weekend will be remembered not for fireworks and family cookouts, but for damage assessment and cleanup following the high winds and heavy rain that downed trees when Hurricane Arthur came ashore on July 3. U.S. Forest Service researchers believe that Arthur did relatively little harm to the state’s coastal forests, but they will continue to watch for delayed impacts of the storm using the satellite imagery-based ForWarn—a forest disturbance monitoring tool which provides maps that compare current vegetation greenness with that of the previous year, the last three years, and the past decade. Of greater concern to the researchers and ForWarn users in North Carolina are the lingering effects of another storm — 2011’s Hurricane Irene. A ForWarn image from July 2014 shows the lingering impacts of saltwater damage from Hurricane Irene. The red colors on the map signify the areas with the greatest reductions of vegetation greenness. While driving to that meeting, Trickel and another NC Forest Service staff member observed the disturbance highlighted on the ForWarn maps firsthand. “We saw classic signs of salt damage. Many of the pines and hardwoods were dead and had already lost their leaves. Leaves on trees that were clinging to life were off-color. The scrubby understory was a mixture of living and dead shrubs and grasses,” remembers Trickel. “After talking to some locals who said the area was inundated with water after Irene, there was no doubt that this was salt damage that could be traced back to the storm surge from the hurricane.” Today, according to Trickel, most overstory trees in this area are dead, their leaves gone and bark sloughing off. Though these coastal North Carolina forests may eventually recover, they might require the assistance of land managers along the way. ForWarn is a collaborative effort involving multiple federal and university partners. 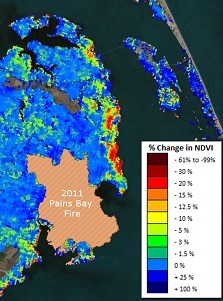 Learn more about the ForWarn assessments of the Pains Bay Fire and Hurricane Irene disturbances. For more information, contact Bill Hargrove, Eastern Threat Center research ecologist and ForWarn project director, at whargrove@fs.fed.us. *The Forest Disturbance Monitor is a complementary tool developed by Forest Service Forest Health Protection. Visit the Forest Health Protection Mapping and Reporting Portal to learn more.